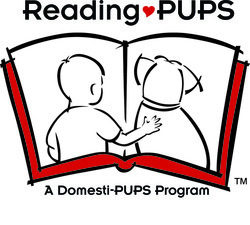 The Reading-PUPS program utilizes therapy teams to assist children with speech and reading difficulties. Children are more at ease reading out loud to a friendly dog than a human. Domesti-PUPS pet therapy teams visit local schools and libraries to help motivate children to read and improve their confidence levels. Research with therapy animals indicates that children with low self-esteem are often more willing to interact with an animal than another person. They focus better on an activity or discussion when an animal is present, and refer back to the sessions many times in later conversations. Further, during such interaction they are inclined to forget about their limitations. There are also physiological benefits to interacting with animals, including increased relaxation and lower blood pressure. We have seen that children find reading to an animal less intimidating, a special time for them that is helpful and fun and which transforms the formerly dreaded reading experience into a positive environment in which learning is facilitated. One key to the success of the Reading-Pups Program experience is a shift away from the reader viewing themselves as the target of yet another remedial program, and toward them seeing themselves as tutors and helpers for the dog. This is liberating and satisfying for the reader, and frees them from performance pressure. These are the benefits we anticipated for participants in the Reading-Pups program, and all are occurring: Children improve their reading skills in a unique and fun environment; The program is extremely flexible and can be implemented in many settings; The program promotes another way that animals can make a positive difference in children’s lives; The program effortlessly crosses all socioeconomic and cultural lines, since the animals are without bias and judgment; The program addresses the “whole person” of the child, thus the benefits overflow into other areas of the child’s life beyond reading and intellectual skills.